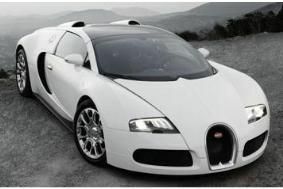 Dynaudio creates in-car sound system for £1m Bugatti Veyron Grand Sport | What Hi-Fi? Dynaudio was commissioned by the Italian supercar maker to create the ultimate in-car audio system for the Veyron. The result is called Puccini, and uses Dynaudio speakers driven by a high-performance 300W digital amplifier. Due to the fact that the car is only a two seater, Dynaudio limited the number of drive units in the cabin to just four, and concentrated on optimising the sound quality in the space available. The speakers are made from Magnesium-Silicate-Polymer cone material and ultra-light aluminium voice coils. There are two 17cm bass/midrange drivers (one in each door) tuned to deliver "a tight and dynamic sound, with deep bass and excellent midrange reproduction", says Dynaudio. High frequencies are handled by a pair of 20mm tweeters, fitted with specially coated soft domes. And if you have to ask how much the Bugatti Puccini audio system costs, chances are you can't afford it. The car itself will set you back £1.1m.